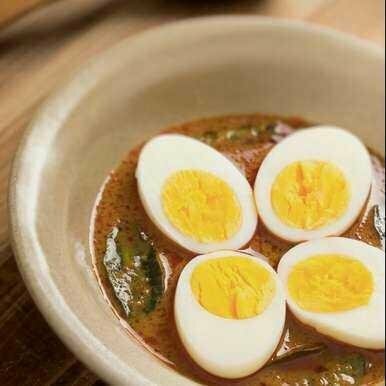 , onion, green chili, ginger and garlic paste to make egg curry. Take a pan, pour oil into it and saute to the pace for about 2-3 minutes. Take a small bowl, mix the curd and cream together and put it on the griddle. Stir well. Then add Kasuri methi, garam masala, red chili powder and salt together and mix together. Pour in the mix water again and bring a boil to this mixture. Cook this for 10 minutes. Pour the boiled eggs into the pan and cook for 5-6 minutes. Garnish with fresh coriander leaves from the top and serve it hot.